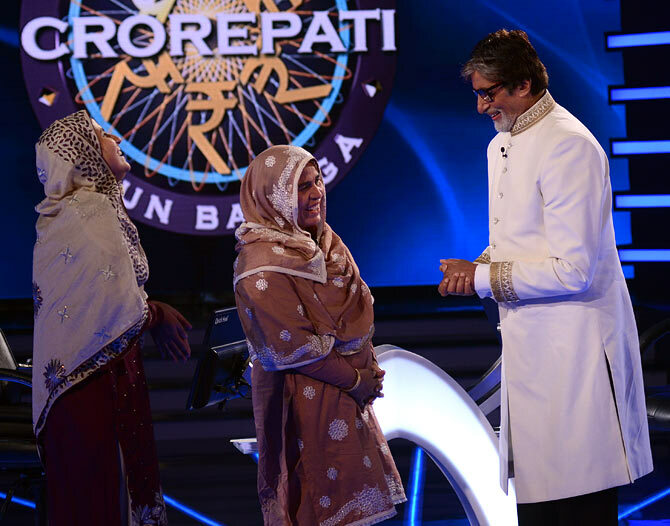 Firoz Fatima, the first lady crorepati on Kaun Banega Crorepati, Season 7, speaks to Rediff.com's Rajul Hegde. 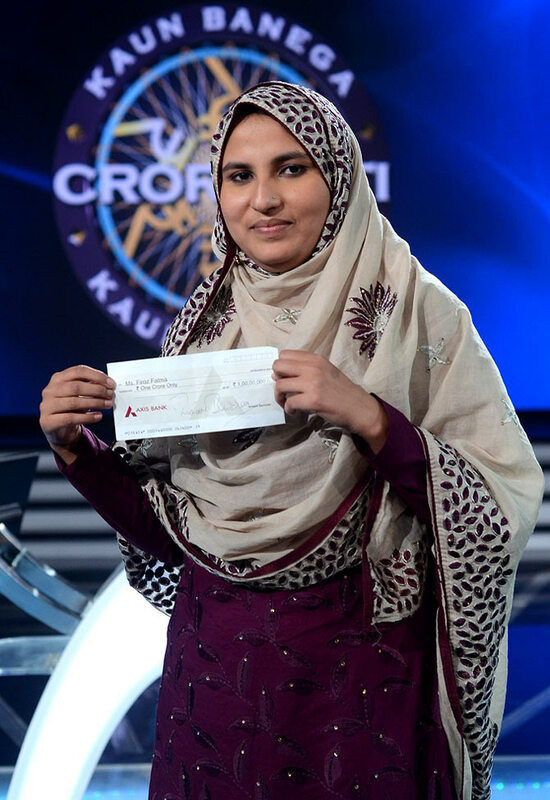 Firoz Fatma, 22, from Saharanpur, Uttar Pradesh, is the first lady crorepati on Kaun Banega Crorepati, Season 7. "The first thing I bought after I won KBC is a touch screen mobile phone!" says Firoz. Firoz spoke to Rediff.com's Rajul Hegde about the KBC experience and how much the big win means to her. When did you first think of trying for KBC? I have been trying for the last four seasons, but never got through. That didn't stop me from sending SMSes. I was selected in July and called for an audition in Lucknow. When the opportunity came, I devoted my full attention to preparing for the quiz. We don't have a computer at home, so to use the Internet I would have to travel 15 km, which was out of the question. I watched news channels and read the newspapers. I didn't go to any coaching classes. We bought an inverter (a gadget used to produce electricity in north India when there is no electricity) to watch KBC because of frequent power cuts in the village. I am waiting to see my picture in the diary. 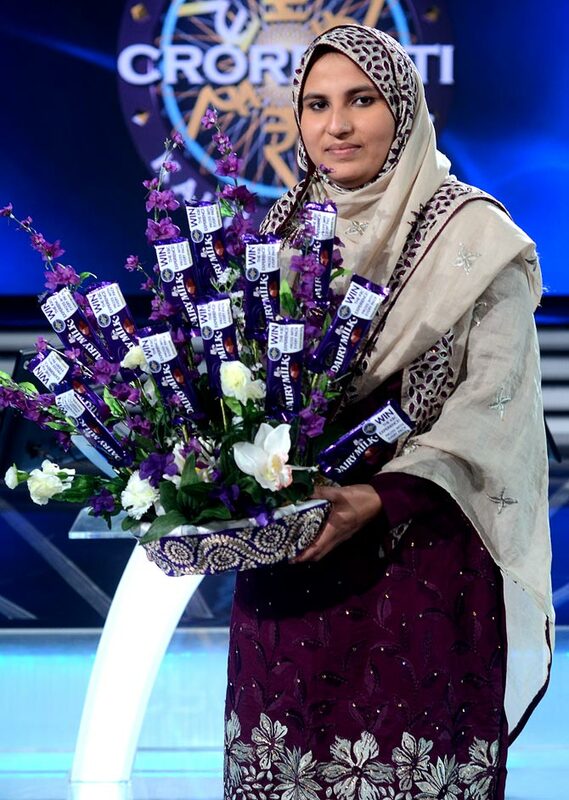 Image: Firoz Fatma, the first female crorepati on KBC 7. What was the KBC experience like? I didn't expect to win one crore (Rs 10 million) at one go. In fact, I never thought much about the money when I went to play the game. I was very nervous when I wasn't able to make it to the hot seat. But in the third round, I aced the Fastest Finger First and made my way to the hot seat. I had a chance to win Rs 3 crore (Rs 30 million) but there was this risk of losing the money (the Rs 1 crore). I wasn't confident of the 13th question and since I had used all my three lifelines, I had to quit. Image: Firoz Fatma with the winning cheque. What was it like to meet Amitabh Bachchan? Amitabhji is my all time favourite actor. It was a dream come true to meet him. I was very nervous when he shook my hand. It took some time for me to settle down. My mother is a huge fan of his. She was more excited than I was to see and meet him. Bachchanji is good in all his films, but my favourite is Mohabbatein. Image: Firoz Fatma with mother Fareeda Parveen Jehan and Amitabh Bachchan. Have you become a celebrity in Saharanpur? I have been treated like a celebrity in Mumbai! I have been continuously giving interviews. 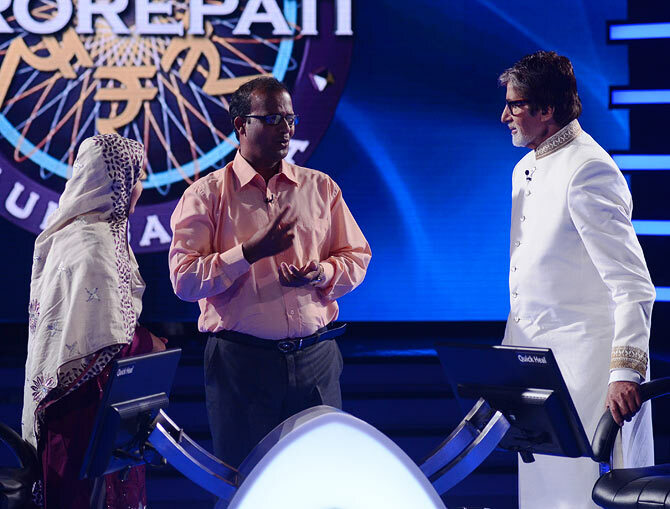 Everybody in Saharanpur knew I was participating in KBC, but they were not aware of the amount that I had won. We didn't tell anyone about the prize money till we came back to Mumbai. How do you think they will react when you go back? I have been getting a lot of calls after the news came out in the newspapers. Friends and relatives are waiting to meet me. Some of my relatives didn't like that we were studying in college. My father always encouraged us to study. Now I think it will set an example for everyone in the family to educate their daughters. I wanted to study further, after BSc, but could not due to financial problems. My father died of a heart attack two years ago. Image: Amitabh Bachchan hugs Firoz Fatma after her triumph. Where did your father work when he was alive? He worked on a small piece of agriculture land that we have. What do you want to do with the prize money? The first thing I bought after I won KBC is a touch screen mobile phone. I want to use the money for my mother, Fareeda Parveen Jehan, and repay our loan. I will use the money for my younger sister Fayaza Khan's education. I want to prepare for the UPSC (Union Public Services Commission) exams with History as a major subject. 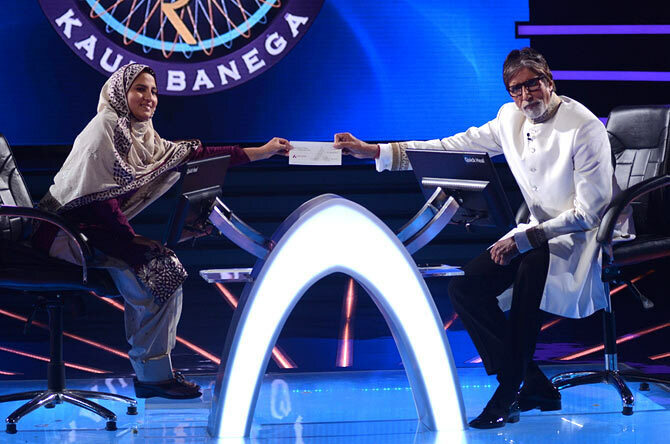 Image: Firoz Fatma along with KBC host Amitabh Bachchan. Is this your first visit to Mumbai? No, this is my second visit. I was in Mumbai 15 days ago for the first time to play KBC. It was my first flight experience too. I was very thrilled. This is the third time I have travelled by air. All thanks to KBC (smiles). I got to see Ayushmaan Khurana (the Vicky Donor star). He paid a surprise visit to the sets. I have visited a few places in Mumbai, but I don't remember the names. This is one of the best places I have visited. I have gone to Lucknow and Delhi, but I like this place and the people out here. I would love to come back to the city with my sister for some proper sight-seeing. Image: Firoz Fatma and Amitabh Bachchan. PIX: Gaurav Gera replacing Sunil Grover in Comedy Nights With Kapil?